Melodic, dream-gazers Zigmat are performing at Public Assembly in Williamsburg, Brooklyn tonight (10:30pm). I've been a fan since they performed at the Remezcla release party at Club 205 back in 2007 (i think)? They have since changed their style a bit, dug deeper into their souls to find what really makes them tick, and are turning out to become a beautiful, electronic butterfly or series of glow bugs. Duno how else to explain, but I love it. Electro-rock. Punky. International. Stylish. Bewitching. These are a few of the words that music critics have used to describe the Brooklyn band Zigmat. Fronted by vocalist Monica Rodriguez and bassist Stephen Yonkin, this ensemble manages to bring together an eclectic mix of world, punk, trip-hop and rock in a unique way that has won over critics and fans alike. Together for three years, the band has been signed by two labels (Ultra Records in Brazil and Actua Musica in Spain) and has performed in the US, Brazil, Mexico and will make their debut in Europe this Fall. The band initially formed in 2006 when Rodriguez was searching for a bass player. Coincidentally, she and Yonkin had both attended the Berklee School of Music in Boston at the same time but never met until after they both graduated and settled in Brooklyn, New York. “We just met while hanging in a bar, and she said that she needed a bass player…and I was looking for a band,” recalls Yonkin. 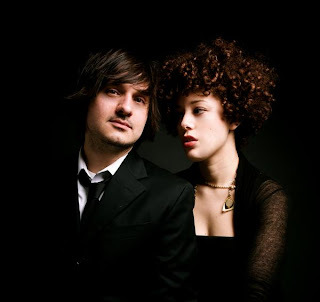 The two musicians spent the following year writing songs and collaborating on ideas that eventually turned into their first EP Sounds of Machines that they self-released in the US in July 2008. Brazilian label Ultra Records signed the band in 2008 and released a full-length by the same name in Brazil. The band was later joined by various musicians for touring in Mexico, Brazil and the US, and played several notable venues in New York City, including the Canal Room, Nublu and the Mercury Lounge. Zigmat has also performed for the LAMC and CMJ festivals in New York and the SXSW festival in Austin, Texas. In May of 2009, Zigmat released their debut full-length album in the US also entitled Sounds of Machines as well as their new music video “Machine”. The album consists of nine tracks, each showing a different aspect of Rodriguez’s vocal agility, which Billboard Magazine calls “the band’s secret weapon.” Four of the tracks deal with the pains, wants and frustrations of love: the album opens with the introspective, trippy ballad “Whisper” that describes longing and regret, then moves into the angry track “Decide” which tells the lover in both English and Spanish to “shut up!” “Light of the Moon” paints a dark picture of pseudo-sadistic lust while the track “So Sure” depicts an unrequited love. The band uses poetic lyrics in the tracks “Watch the World”, “Between Bullets” and “Fire”, each one displaying Rodriguez’s upper registers with a hushed and angelic quality. “Don’t Tire” is the album’s other Span-glish track, and “Machine” closes out the album with the band’s signature haunting, trip-hop riffs. Zigmat’s music has been featured in the film “Backseat” (by Bruce van Dusen) and has garnered local television appearances in New York City (Hit Records Nightlife Videos) and Philadelphia (NBC’s The 10! Show) as well as national TV appearances on Fox’s Fearless Music TV and on SiTV. Radio appearances include Batanga Radio, KPFA in Los Angeles, and KCRW’s “The Morning Becomes Eclectic”. This year, Zigmat has signed with Spanish label Musica Actua and will tour Brazil and Europe this Fall.